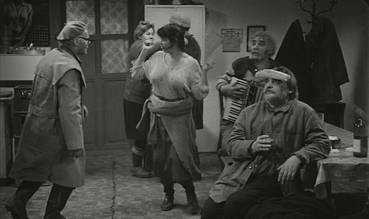 If your concept of Eastern European cinema involves films filled with long silences, sombre conversations, bleak windswept landscapes, grubby interiors and unhappy-looking peasant types, then Sátántangó will only serve to confirm your prejudices. It's loaded with them. Oh, and it's in black and white, so the bleak looks REALLY bleak. If you won't watch these films because you expect them to move at a snail's pace and have long takes in which nothing much happens, then you're really going to have problems. Shots here can run for up to ten minutes each, will often feature just one person doing one thing and will frequently be free of dialogue. Have I lost you yet? No? Well try this on for size. It's seven hours long. You heard me. That should whittle down the pack a little. Still interested? Good. Now we can talk. Sátántangó is set in a small rural farming community in post-communist Hungary. The autumn rains have begun and activity within the village has ground to a virtual halt. Early one morning a church bell begins to toll, even though there is no functioning church nearby, and after the sun has risen a figure wanders into shot to investigate. At this stage we don't know who he is, where he is, or even in this light what he looks like. By this point we are just two shots and twelve minutes into the film and you soon realise that information is going to be slow and often unclear in coming. Over the course of the next ten minutes we discover that the man is named Futaki and the woman he is with is not his wife but that of his neighbour Schmidt, whose sudden arrival home sends Futaki scurrying to the back room. We overhear that the community has a sum of money and that Schmidt is planning to run away with his share. We know little about the money itself or its purpose, and just as we might be getting close to finding out more, a new chapter begins. We're forty-one minutes in by now, a third of the average feature film running time. Here we've barely scratched the surface. In the second chapter we are introduced to Irimiás and his cohort Petrina as they walk down a wind-blown road towards what at first seems like a hospital but is eventually revealed to be a government building, possibly a police station. Here the two are grilled by an unnamed uniformed official and given a lecture on order, freedom and collaboration. The pair are humble and obliging, but back outside display a more self-confident and authoritative swagger. Irimiás is on his way back to the village, and when news of his impending return reaches its inhabitants, apprehension spreads like a virulent flu. And so it continues. There are twelve chapters in all, told from differing viewpoints with overlapping narratives – the story progresses in linear fashion, but the start of a new chapter may move events back a few hours to replay part of the previous chapter from a different angle. The narrative itself is for some time ambiguous in structure – halfway through I began to suspect I was now watching events that occurred before those of the opening scenes, a view I later reversed. Not that this necessarily matters, as it becomes increasingly evident that storytelling in anything approaching a traditional sense is not what Sátántangó is all about. 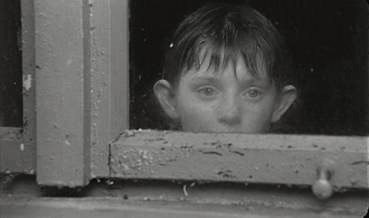 Sátántangó arrives on UK DVD having already been proclaimed in many quarters since its 1994 release as a masterpiece, a label the more cynical viewer should consider it their duty to be ready to challenge. It's strikingly photographed, rejects formal storytelling techniques and appears to be about very little, but could, with the viewer's collaboration, be about a great deal. It hails from Hungary rather than a more cinematically populist region, and it's far longer than even the most laborious western film, which will effectively dissuade all but the dedicated from seeing it and contributing to the discussion. But does that even make it good, let alone a masterpiece? Doesn't that make it boring, pretentious and self-important? Is the sense that there are more layers of meaning than the surface suggests the result of the viewer projecting their own, dreamed-up interpretation onto an effectively blank canvas? It certainly looks meaningful, so surely it must be. Mustn't it? I've just spent seven hours of my life watching the bloody thing, so it must mean something, surely! Before I go on I should say that all of the above thoughts did occur to me while I was watching Sátántangó. There were moments in the first third where I began to sense that the Emperor's clothes were not quite as fine as his courtiers were assuring him they were. But somewhere in the first three hours of watching the film – I can't mark the precise point because I don't think there was one – I found myself strangely and completely hooked. Maybe it takes time to adjust to the film's pace and fascination with still moments, with the way it locks onto faces and asks us to do likewise. It seems to want us to search for the story behind that expression, behind what happened in the months before Mrs, Schmidt came into the bar and sat down at the table to stare off into nothing, her concentration only broken by the need to investigate a smell coming from beneath the table. The most remarkable example of this technique is also one that almost sabotages itself. A young girl is tricked out of what little money she has and on returning home is ordered by her mother to sit outside on a chair that has clearly been set up for that very purpose. A short while later, she crawls into a barn and we watch her wrestle and threaten a domestic cat, and in her face and in her voice we see and hear the parental indifference and verbal and physical abuse she has suffered for years and the despair that is eroding her will to live. It's a powerful and affecting scene, but the problem is that the animal she is re-enacting her mistreatment on is a real cat undergoing real abuse, and my sympathies for the girl's predicament (which, let's be fair, is performed, albeit with total conviction) ended up secondary to my concerns for the animal she was pulling about. Thus, for a while the scene becomes about the making of the scene, as I was dragged out of the story and into the process of creating it. This is made worse when she forces the animal to drink poisoned milk and watches it die, something that certainly looks very much for real, and handily provides a dead cat for her to carry in the shots that follow. If you can deal with this then you'll witness minimalist filmmaking at its most troublingly effective, but it's likely to send animal lovers reaching for the fast-forward button. It is this chapter also that provides the most memorable narrative crossover point, as the girl stops by a window to watch the haphazard but exuberant dance taking place within, an event we later witness from inside in its entirety in one long, slow-moving and utterly compelling shot, interrupted only for a cutaway of the girl looking in from outside, her despair and dislocation from the other villagers painfully evident. There is the sense at times that we are being asked to look not just at the content of a shot but its execution, to appreciate its artistry of the filmmakers, and certainly there is a great deal to admire here. 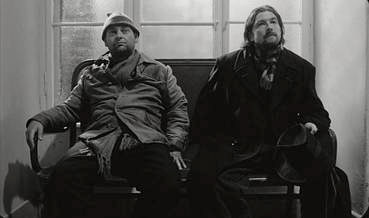 Gábor Medvigy's black-and-white cinematography is brimming with divine compositions and beautifully executed camera moves, including stedicam work so solid that you'll have trouble telling it from the on-the-rails tracks. So many of the shots lodge hauntingly in the memory, whether it be the long opening drift through the farm, a slow and measured track up to a perched owl, or the impossibly long circling of two policemen as they doctor and type up a letter from Irimiás. There's barely a shot in the entire film that does not leave you wide-eyed at the care with which it has been planned and executed. Most compelling of all are the tracking shots that follow or precede the characters as they walk, ride or, in a sudden and almost jarring return to the modern world, drive. Even though there is a peculiar artificiality to some of these sequences – as characters walk down a furiously wind-blown street and drive through the rain I was very aware of the wind machine and hoses used to create the weather effects – they are still so striking as imagery and effective in their subtexual suggestion that they become a storytelling technique in their own right. This is most pronounced when we are moving backwards watching the faces of characters as they move, with the young girl's long walk with her dead cat once again proving the most haunting and emotive of all. These sequences inevitably recall the 'walking movies' of late era Alan Clarke and prefigure the more recent work of Gus Van Sant, whose Elephant and Last Days achieve a similarly hypnotic hold while little is seemingly taking place. It would not be a stretch to suggest a Tarkovsky influence either, although this is more down to the look and feel than the storytelling technique. Sound is also most effectively used (the strangely distorted church bells and the hum in the café that so angers Irimiás have an almost Lynchian quality to them), and combined with the emotive visuals and some fine performances create a concrete-thick atmosphere and sense of place that is increasingly seductive, dragging you into a world of strangely logical inactivity, where people wait for possible salvation at the hands of a man they are prepared to believe in but still do not trust. It's with good reason, too – Irimiás may have the Jesus beard, appear to have risen from the dead and be able to deliver a sermon of hope, but he represents the darker side of the new capitalism and is poised like a vulture to feed off the unwary. So does Sátántangó justify its seven hour running time? Well in a way it does. If you take a sixty minute story and present it in this manner and at this pace, then it's going to take seven hours to do so. But by telling this story at this speed and in this way, director Béla Tarr so drastically alters the way we absorb and interpret the supplied information that time measurement is effectively altered for the viewer. Despite long periods of seeming inactivity, the result is never boring and is often mesmerising, and hard though this may be for some to believe, it does not feel overlong. I'm not sure I'm ready to go with the masterpiece label that has been applied elsewhere, as for all its considerable qualities I still can't help thinking that its messages and meanings are a little too much in the eye of the beholder. But it's still a bold, unique and gorgeously made film that offers a very different viewing experience from the movie norm, and that alone is to be enthusiastically applauded. The non-anamorphic transfer is framed approximately 1.68:1 and is generally of a high quality, with detail very good and contrast bang-on at best, although some scenes display a narrower band of the greyscale where black levels are virtually non-existent. Clean for the most part, there are a couple of dust spots here and there, a not too intrusive scratch on one shot and a little side light leakage on another. On the whole, though, a decent job, though anamorphic would have been nice. The Dolby 2.0 stereo soundtrack has no show-off separation, but is crystal clear, particularly on sound effects such as wind, rain and, erm, flies. 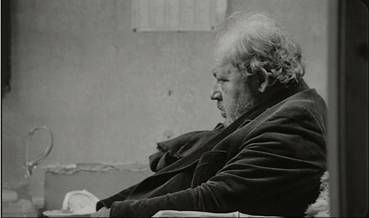 All that's on offer here is a Béla Tarr filmography. Although it took me a while to synchronise with the film's pacing, once there I found it a very comfortable and sometimes inspiring place to be. In order to check something in this review I just half-an-hour ago put the first disc on again and found myself instantly hooked, noticing small things I didn't pick up on the first time round. There's no doubt that Sátántangó presents a challenge for the viewer, but if you're up for it then you're in for a film experience quite unlike any other. Artificial Eye's 3-disc set lacks any notable extra features and it's a shame that the picture is not anamorphically enhanced, but for the most part serves the film well.